by Davies, Fred T., Jr.; Geneve, Robert L.; Wilson, Sandra B.; Hartmann, Hudson T.; Kester, Dale E.
World standard on plant propagation and horticulture for over 50 years! 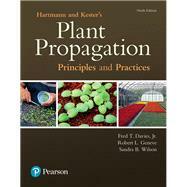 Hartmann and Kester’s Plant Propagation remains the field’s most complete and up-to-date guide to the principles and practices of plant propagation. Using color figures throughout, the text pairs chapters on horticultural science with commercial techniques for plant propagation. It starts with an introduction to the industry and basic plant biology, and then dives into more complex technical concepts, ranging from seed and vegetative propagation, to propagation techniques for specific fruits, nuts, and crops for the greenhouse and nursery. The extensively updated Ninth Edition integrates the latest breakthroughs and innovations, including advances in plant hormone biology and the molecular basis of plant growth. It includes a vast new range of color photos taken at commercial producers and research labs around the world. Instructor resources, such as PPTs, TestBanks, and Instructor Manuals, can be downloaded here. Fred T. Davies, Jr., is a Regents Professor emeritus of Horticultural Sciences and Senior Borlaug Fellow in Horticulture at Texas A&M University. Early in his career, he got hooked on the biology of cutting propagation, presenting propagation research as a graduate student at his first International Plant Propagators’ Society (IPPS) meeting in 1975. He is a Past President of the IPPS-SR and the American Society for Horticultural Science (ASHS) (2011). He is IPPS-SR Editor, an IPPS Fellow, ASHS Fellow, Meadows Awardee, and received the IPPS International Award of Honor (2015). Davies has worked internationally at research institutes and taught at universities as a Guggenheim Fellow (1999), and Senior Fulbright Fellow to Mexico (1993), Peru (2000), and Indonesia (2012). In 2014, he was a Jefferson Science Fellow/Senior Science Advisor at USAID–U.S. Agency for International Development–helping with the Feed-the-Future program. He continues to work internationally in food security and in promoting entrepreneurial and career opportunities in horticulture. Robert L. Geneve is a Professor in the Department of Horticulture at the University of Kentucky. He teaches courses in plant propagation, seed biology, and plant identification. He has co-authored over 100 scientific and technical articles in seed biology, cutting propagation, and tissue culture. He is also the co-editor of the book Biotechnology of Ornamental Plants and author of A Book of Blue Flowers. He is a Past President for the International Plant Propagators’ Society, Eastern Region, and a past Delegate on the International Board of Directors. He has served as the Editor for the international horticulture journal, Scientia Horticulturae, from 2001 to 2008 and is currently on the editorial boards of the Propagation of Ornamental Plants and the Journal of Seed Technology. He is the recipient of the University of Kentucky George E. Mitchell Jr. Award for Outstanding Faculty Service to Graduate Students (2006), and is a Fellow of the American Society for Horticultural Science (2005), as well as a Fellow (2003) and Award of Merit recipient (2014) for the International Plant Propagators’ Society, Eastern Region. Sandra B. Wilson is a Professor in the Department of Environmental Horticulture at the University of Florida. She teaches courses in plant propagation, native landscaping, and annual and perennial gardening. She has co-authored over 150 scientific and technical articles in plant propagation, container production, and landscape use, as well as teaching innovation and methodology. She has served as Associate Editor for the Journal of Native Plants. She is the recipient of the University of Florida Undergraduate Teacher of the Year Award (2006) and the American Society for Horticultural Science Outstanding Undergraduate Educator Award (2009). She has been recognized with the North American Colleges and Teaching of Agriculture Fellow Award [NACTA] (2005) and the American Society for Horticultural Science Fellow Award (2015). Wilson served as ASHS Vice-President for Education (2013-2015) and a Board member of the International Plant Propagators Society — Southern Region (2013-2015).